In August, prepays crested 8% for the first time since July 2010. 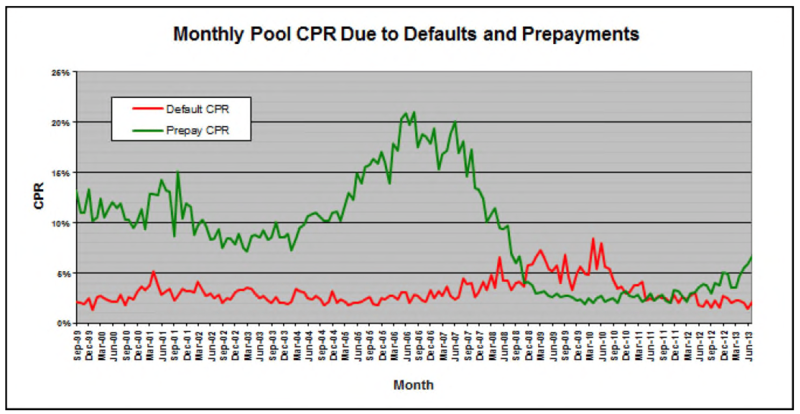 For August, both defaults and voluntary prepayments rose, pushing overall CPRs to levels not seen since prior to the credit crisis. As for the detail, overall prepayments rose 21.17% to 8.83% from 7.29% in July. In comparing prepayment speeds for the first eight months of 2013 to the same period in 2012, we see that this year is now running 30% ahead of last year, with YTD CPRs at 7.18% versus 5.51%. As for the largest sector of the market, 20+ years to maturity, prepayment speeds rose by 33% to 8.11% from 6.09%. Turning to the CPR breakdown, the default CPR rose by 46% to 2.10% from 1.44%, which was the second lowest reading since the beginning of 2000. Regarding voluntary prepayments, they rose above 6% for the first time since October, 2008, increasing 15% to 6.73% from July. Preliminary data for next month suggests that voluntary prepayments will fall back below 6% while overall CPRs drop back into the 7% range, where they have spent most of this year. Turning to the default/voluntary prepayment breakdown, the Voluntary Prepay CPR (green line) rose to 6.73% from 5.85%, a 15% increase. While the VCPR moved above 6%, the Default CPR (red line) also rose, increasing 46% to 2.10% from 1.44% the previous month. Prepayment speeds rose in five out of six maturity categories. Increases were seen, by order of magnitude, in the 13-16 sector (+103% to CPR 7.27%), 16-20 (+46% to CPR 12.81%), 20+ (+33% to 8.11%), 8-10 (+14% to 7.16%) and 10-13 (+4% to CPR 10.13%). The lone decrease was seen in <8, which fell by 45% to 10.96%. With four months in a row of +7% prepay speeds, it would seem that we are at the beginning of a rising prepay environment led by increasing voluntary prepayments.